Trompo Has Sold Out Of Tacos Every Day Since Being Named One Of Nation’s Best New Restaurants. To say that Luis Olvera’s fortunes have changed in the past year is an understatement — because they’ve more than changed, they’ve undergone a full 180-degree turn. As recently as last fall, Olvera was considering giving up on his dream of running his own taqueria here in Dallas, thinking instead of trying for a fresh start in Mexico. Then the folks at the Kessler Theater took a flier on him, offering Olvera the chance to sling the tacos he’d previously sold out of his backyard at its concerts. That opportunity then led to Olvera getting the chance to open his first official Trompo Tacos brick-and-mortar location at 839 Singleton Boulevard in West Dallas — a spot that’s not only earned him local acclaim, but national adoration, too. Last week, Bon Appetit named Trompo to its list of the 50 best new restaurants in America. And that’s not even the best part. This is: Since that article’s August 2 publication, Olvera hasn’t been able to go a single day without selling out of food. People are now lining up before doors open so they can get in on the action. 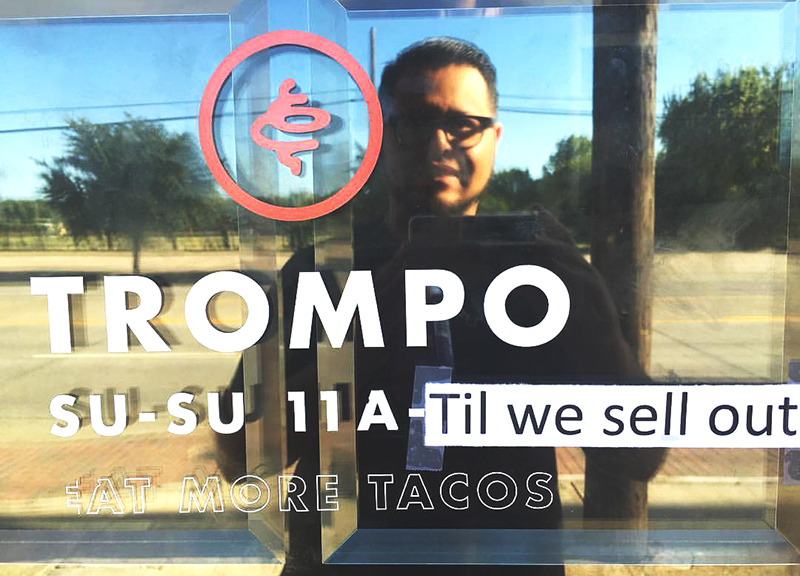 To Trompo’s credit, the taqueria has been cutting complaints off at the pass by apologizing on social media for running low on supplies, and seeking additional employees so as to keep up with demand. Olvera’s is a really cool story of persistence paying off, and one we couldn’t be happier to see. Sometimes, the universe is pretty sweet. Especially when you get to Trompo before they sell out of tacos, which Olvera tells us he’s on pace to do once again today, thus putting his sold-out streak at seven days and counting. But, at this point, that much should go without saying, yeah?